Communique and Microsoft® have joined forces to provide advanced audio conference call bridge service that is fully integrated with Microsoft Skype for Business. Bridge Skype for Business computer and telephone audio (PSTN) callers, Outlook e-mail integration, mute/unmute attendee lines, audio recording integration, real-time participant status, and more. Best price: No contract, set up fee, or monthly per user fee. Best service: Rank #1 Global Conference Provider by Wainhouse Research in 2012, 2014 & 2017. It’s our commitment that the last thing any of our customers ever need to worry about is their conference calls. No matter if you’re a one-person shop or a global conglomerate, we do it all, including the worrying, for you. We assign a dedicated account manager and provide fanatical live 24x7x365 support. Global Coverage: Local and toll-free access from over 107 countries worldwide. Custom Branding: We can private brand your Skype for Business audio conferencing service to promote your company and build your brand as attendees join your calls. Click here to listen to a sample branded conference call prompt. Get a better meeting experience with reliable, high-quality audio on a secure enterprise telephone network for up to 300 participants. Connect participants globally with local or toll-free access from over 107 countries. Communique audio conferencing comes with 24/7 support across the globe. Simply press *0 for help. 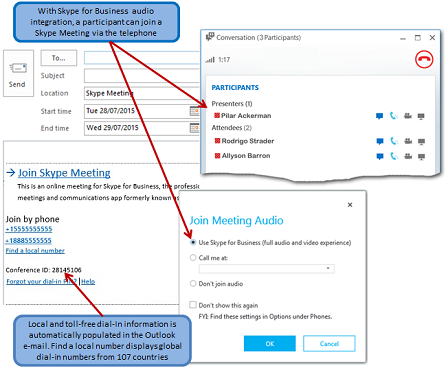 Meetings continue to be managed from the Skype for Business interface and require no additional end user training. To easily manage your account. Add, modify and remove users instantly. View and pay your bill online. Experience matters. Communique is the worldwide audio conferencing leader. With 99.99% up time and 24x7x365 support, you can rely on Communique to for reliable, crystal clear, Skype for Business audio conference call service. For 14 years, Communique has been delivering reliable conferencing solutions to business, non-profit and government clients. Over 34,000 uses in over 34 countries trust Communique for their important conversations.